The Rovensky Field House, the former hockey rink that has been vacant since the construction of the Stewart Athletic Center three years ago, was torn down on June 7. 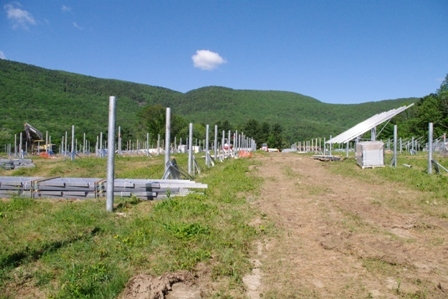 Meanwhile, across Route 41, construction continues on the two-megawatt, eight-acre solar field on East Campus. Built in 1960 and renovated in 1998, the Rovensky Field House was a cold, cavernous structure that in the spring was converted to indoor tennis courts and in the summer was the home of the Berkshire Choral Festival. Both functions now take place on what is the east rink of the Stewart Center, where Prize Night is also held. According to Head of School Mike Maher, the site will be reconditioned and landscaped as a courtyard. He added that in the long run, the area will likely become a dedicated center for the arts. The solar field will comprise over 9,000 photovoltaic modules and will generate up to 40% of the school’s electricity needs. When commissioned this summer, the installation will be one of the largest operating facilities of its kind at any school in America, college or high school.